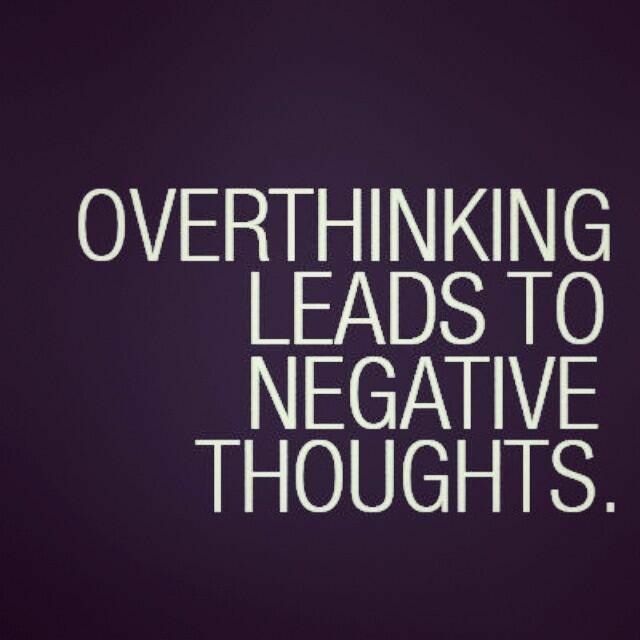 Overthinking is the best way to make ourselves miserable, and in my opinion, one of the most important aspects of our spiritual evolution is learning to decrease the mind-driven pressure we tend to put on ourselves and just exist, free of any stresses, worries or concerns. Negativity is inevitable, and whether it’s from outside or within, we’ll always have to deal with it as long as we’re on this planet. We can choose how to handle it, however, and instead of feeding it or letting it bring us down, we can recognize that despite how real it seems, it’s always been an illusion. As we’re learning, true reality is found when we transcend the rigid, overactive mind and find a place of peace and inner silence. We won’t find true reality by searching for it, externally or in the mind, and in my experience, the best way to find it is to stay active and progressive yet calm and silent within. Throughout our attempts to stay active, we might find that our own mind makes us unhappy. Thought after thought tends to pour in regardless of our mood or our emotional state, and if we’re in a negative frame of mind, our thoughts will reflect that negativity and we’ll make ourselves miserable. A lot of spiritual teachers encourage us to transcend positivity and negativity, and they claim that trying to stay positive is another way we trap ourselves because positivity is just one side of the dualistic coin. I think there’s value in staying positive, however, and especially for those who suffer with depression, positive thinking can be valuable. We can still go out of our way to transcend the dualistic happiness and sadness we’ve become so familiar with, but when we start having negative thoughts, I don’t see any reason why we shouldn’t try to turn them around. If you think about it, we have every reason to be grateful for this existence. We have every reason to enjoy our lives and bask in the sunshine, but we tend to stop ourselves from enjoying life or doing things that inspire us and light our inner fire. Why is that? The only reason I can think of is that the rigid mind, when given too much influence, tends to stop us from opening up to life. This is one reason it helps to diminish the mind and ego’s influence as we go about our day, and life will give us plenty of reasons to be happy and grateful when we do. We’ll find that we’re generally happier and more satisfied with life when we don’t let the mind and ego control us. When we can open the mind and access our intuitive side (sometimes known as the ‘inner voice’ or the ‘higher self’), we’ll experience an ease with life that we never felt when we let the mind become rigid and control us. We’re in control of our thoughts and emotions, but we have to believe in ourselves in a higher sense and refuse to give in to the mind’s constant need for emotional stimulation, which I’d imagine causes more suffering than anything else. Most people don’t realize that the source of most of their unhappiness is their own mind, and this includes spiritual seekers. Even though we’re advised not to let the mind become too rigid or influential, we still tend to listen to it more than the higher aspects of our consciousness that are trying to guide us into a lighter existence. We still tend to let our own mind enslave us, and this obviously isn’t its purpose. Its purpose is to help us cultivate as easy and free-flowing of a life as we can, and it becomes our ally when we learn to use it instead of letting it use us. We have to exercise a higher form of control over our minds (which some people call discipline) if we want to get the most out of life, and we’ll continue to feel cursed if we don’t get a grip on our mind and emotions and use these tools the way they’re meant to be used. The mind and the emotions can become the greatest instruments for the expression of our spirituality if we let them, and all it takes is the willingness to get them under control. It’s always hard at first, but like anything else, it gets easier when we commit to it and refuse to wane from whatever practices help us reinforce it. We need mental discipline, and without it, our thoughts can constantly build up and maybe even make us depressed or angry. Our thoughts and emotions are powerful, and this is why so many astral spooks try to get at us through our thoughts and convince us we’re nothing. They can only get to us if we have things within that we need to resolve, so beyond getting a grip on the mind and thinking positively, we’ll want to find the source of any angst or unhappiness we experience and give it the exposure it needs before we can move on to a joyful life. Until we do, we might continue to battle with negativity. The battle will get easier when we learn to take control over our thoughts and emotions and refuse to let anything bring us down, but we can put an end to it altogether if we source our negativity and give ourselves the healing we need. For now, those of you who struggle with negative thoughts are encouraged not to think so heavily, which I know is easier said than done. It might not sound easy, but if we can achieve it, we’ll find our silent, blissful inner sanctuary and chances are good that we won’t want to leave it. The good news is that we don’t have to. We can stay in our sacred inner silence for as long as we need before we reemerge, ready to take on whatever tasks or responsibilities we have each day, and we’ll never be looked down on for staying in that space. All it takes to get there is the willingness to discipline our minds, and I think it’s crucial that we do. We’ll find our heart (and the overflowing love that comes with it) when we can empty the mind and travel deep within, and we’ll be creatively and spiritually unstoppable when our inner love starts flowing. I’m a twenty-one year old writer, blogger, musician and channel for the creative expression of the inner universe, and I created The Culture of Awareness daily news site.